That’s the Penn Manor Field Hockey team’s very own motto. But the phrase was probably more useful to Hempfield fans when their team got beat by the Comets for the District III championship at Milton Hershey’s school field. The score was tied 1-1 with just over four minutes left in the game when senior, Jill Witmer, was awarded a penalty shot. Yet, Coach Matt Soto made the decision to send Witmer to make the shot. Let’s just say that call paid off. Witmer scored and Penn Manor Comets claimed their first District Championship crown since Soto became coach five years ago. Hempfield was the first to score in the game, minutes before halftime. The Comets, not used to being behind in the points, decided to change their strategy. “We needed to shape up and play our normal game,” said junior midfield, Renee Suter, noting it was about to be a passing game. The Comets are known for their stamina and desire to win. The team was named number one in the country by an internet sports rating association this year. “We have a great coach,” said player, Kelly Harsh. Soto returned the compliment, saying the team is not unique except that “they work so darn hard and know what it takes to be great. “It’s all about them,” he said. 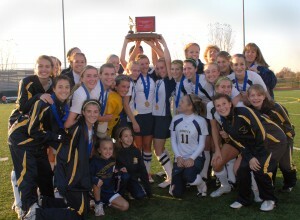 Tuesday, the girls entered the first round of PIAA State Playoffs, hoping to duplicate their state championship of last year. You can bet they will be continuing all their traditions, working hard, playing their trademark song for the trip, Trace Adkin’s “Honky Tonk Badonkadonk,” and winning.